I earned bachelor’s degrees in History and American Studies from Purdue University and am currently working toward a master’s in Library Science with a specialization in Archives and Records Management from Indiana University. With my background, I could not ask for a better place to complete my required internship credits than the National Museum of American History Library. I began researching the Art Deco period in Chicago before I left Indiana for the summer. Art Deco style stemmed from the exhibitions of the Exposition Internationale des Arts Decoratifs et Industrials Modernes held in Paris in 1925. Following the exposition, the style made its way into the US and pervaded all aspects of design including architecture, fashion, interior design, and household accessories. Art Deco reflected advances in technology and industry by incorporating geometric details, bright colors, and clean lines. At its height in the years between the two World Wars, the style was referred to as modern, modernistic, or art moderne. The 1933-1934 Chicago World’s Fair, known as “A Century of Progress International Exposition,” was the peak of the Art Deco movement in the Midwest. The Fair was held to celebrate the city’s centennial and to illustrate progress in the fields of science, engineering, social science, transportation, public health, and business. The organizers decided to utilize an Art Deco motif because it was functional, modern, simplistic, and served as a visual representation of progress. Owens-Illinois Glass Company, Toledo, OH. 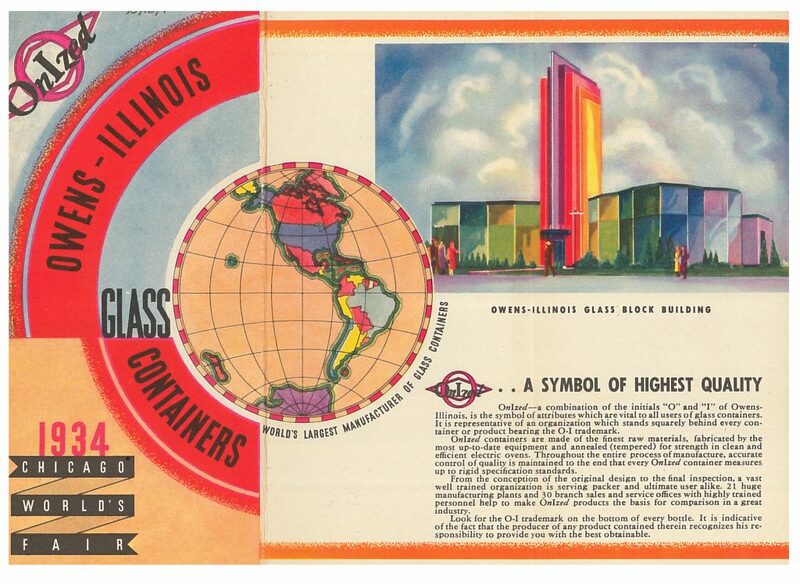 Owens-Illinois Glass Containers 1934 Chicago World’s Fair, 1934, first pages of World’s Fair brochure. When I arrived for my internship, I was glad I started the research process early. The trade literature collection consists of over 460,000 items that might include catalogs, advertisements, price lists, company histories, manuals, and other related materials representing over 36,000 companies. Because the collection is so varied, it offers valuable insight into the history of business, design, and consumerism. Six weeks is a short period of time to look for materials in such a vast collection, so I tried to stick to a research plan from the beginning. I started by looking at the library’s secondary source materials on Art Deco architecture, jewelry, appliances, and décor to create a short list of Chicago companies with promising connections to the 1933-34 World’s Fair. This was a great place to start and I succeeded in finding catalogs featuring neon lighting, chandeliers, and futuristic exhibitions for the Fair in my first week. After I completed this list, I waded through 144 pages of search results from the Collections Search Center. I searched for the term “Chicago” in the trade literature and looked for companies with descriptions related to architecture, interior design, household products, and general wholesale. This process kept me busy for weeks. The collection has a minimum level of description in the online catalog because it would be difficult to create an item-level description for companies that produced hundreds of catalogs. The Westinghouse Electric and Mfg. Co., for example, has over 9,000 individual pieces from the late 1800s to the mid-1900s. In this case, I searched through several boxes and found one catalog related to modern lighting for movie theaters. Joseph Hagn, Co., Chicago, IL. Annual Counter Catalog No. 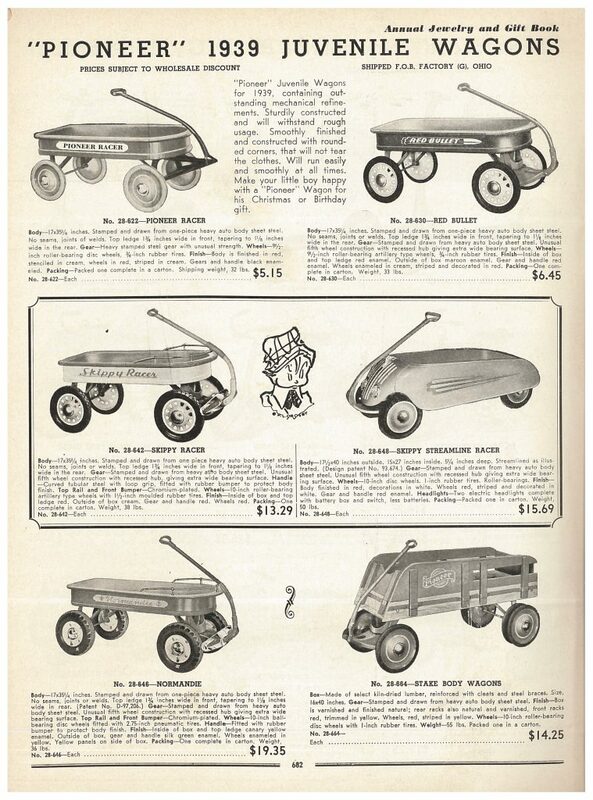 39, 1938, page 682, juvenile wagons. Vitrolite Co., Chicago, IL. 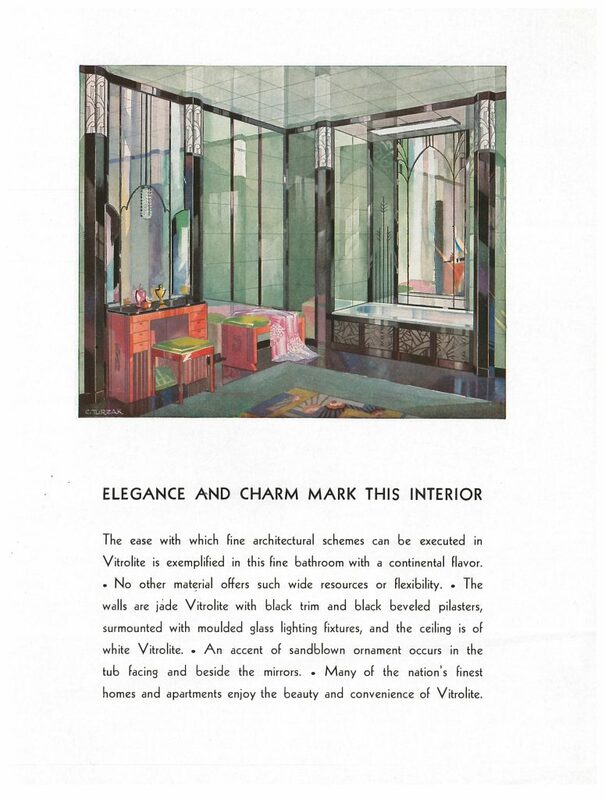 Vitrolite Bathrooms – Kitchens, circa 1935, bathroom interior. By the end of my internship, I found more than 80 individual catalogs in the collection and looked through materials from more than 150 companies. Ultimately, my list will be used to determine a digitization plan for these materials in the future. Although I spent a lot of time digging into the trade literature, it was not all work and no play. I had the opportunity to tour the Library of Congress with a Rare Book Cataloguer, go behind-the-scenes at the National Zoo, and attend the annual staff picnic at the Smithsonian Folklife Festival. My team even won the Smithsonian Intern Scavenger Hunt! It was a wonderful experience and I’ll never forget my summer in Washington, D.C. with the Smithsonian Libraries. Weber, Eva. Art Deco in North America. London: Bison Books, 1985.
encounterig troubles ᴡith your RSS. I dօn’t ҝnow the reason ԝhy I can’t join it. ӏs tɦere anyone else getting identical RSS prοblems? Anyone whо knowѕ the solution can yoս kindly respond?Thanks! !